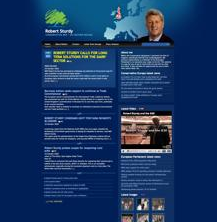 We have now finished our latest website for Robert Sturdy who is a Member of the European Parliament for the Eastern region in England. The theme was designed around the Europ and the UK flag with prominent spaces for Youtube videos and streaming content. The site content is being maintained by Ellee Seymour and Roberts aides in Brussels.